There has been much talk and speculation in recent times about organized religion in general in suggest that the religious practices of this country are no longer useful for people, especially those of the younger generation—Millenials. There is no dispute that there have been changes in the religious temperament of the Western World. Fewer people attend religious services regularly; fewer people belong to the historical religious groups that formed Western Civilization’s moral and spiritual content. Nevertheless, this is not an excuse for those who think of themselves as religious to give up or to surrender commitments to their faith. Certainly, organized religion needs to be and should be criticized. It is not unfair to contend that some television evangelists and smooth-tongued preachers in shiny and can be abusive. If we decide that the institutions of religion are invalid, the ethical imbalances of civilization remain unchallenged. Certainly, irreligious people can be ethical—most are. The problem is the institution of religion is failing to meet the challenge of its social and spiritual missions. Institutional Christianity in the twenty-first century, in order to continue to have a positive influence, must review its purpose, mission, and vision. The Scriptures appointed for Maundy Thursday provide a good place to start in regaining its place is society. 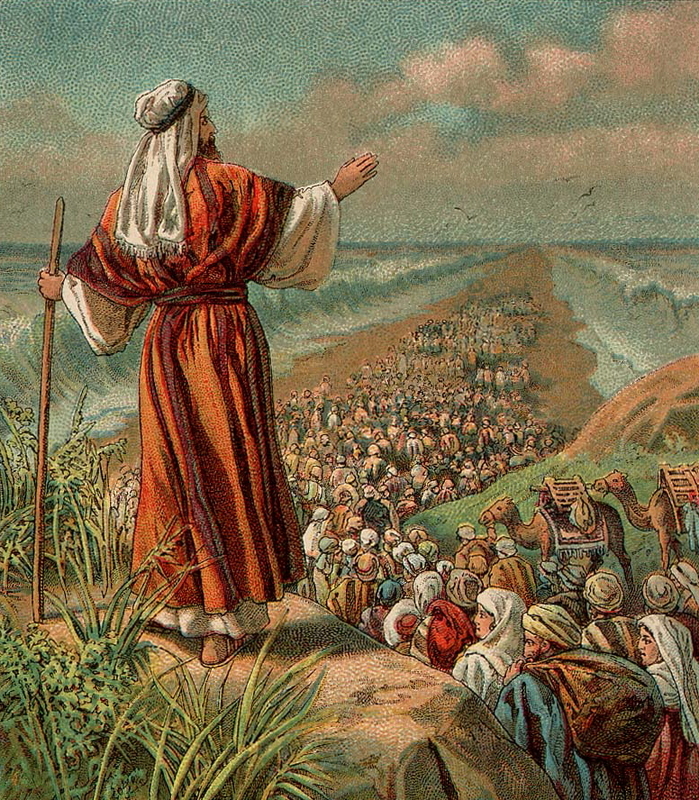 The reading from Exodus tells the Passover story reminding us that the story is important. It is our story. The Paschal Lamb in our story is Jesus. Through him we have passed through the waters of baptism is that we have died like him and then arose from those waters as he arose from the tomb. The story of the Exodus is more than an ancient tale; it demonstrates for us how to tell our story. Most of us in our lives seek liberation from the things that enslave us. In the exodus story we learn that the powers of the universe—in Exodus God and Pharaoh—are in debate over who controls us. If we know the story and how to tell the story, we can find our way out on to the dry land through the Red Sea. Let the Scripture be your story and the way you tell it to yourself. Finally, Jesus gives his followers a command. They are to do as he has done. They are to love as he has loved. They are to demonstrate humility as he is humble. We know all this from the Scriptures. The Scriptures have come to us through the institution of the Church—organized religion. Possibly, through archeology and scholarship, we would know about God, the Hebrews, and Jesus Christ just as we know about ancient Sophocles, Plato, or Aristotle. However, we would only know about God and Jesus; we would not know God and Jesus and be participants of the historical pageantry that began with Abraham and through centuries of Christian life and worship. Therefore, the work of the institution is to call humanity back from its destructive folly. The community of the saved, the institution called the Church, is to provide order in a chaotic world. Paul saw this as the Corinthian Church went astray and turned away from order. The institution of the Church provides a means of protecting people from self-centered high priests, charlatans misusing religion for their own purposes, and ultimately provides spiritual ethos and ethics to daily life. Christian people who are devoted to the Church as the Body of Christ and as the continuation of the story of salvation have a duty to present to the skeptical world a better view of religion—a view that makes a difference. Christians do not have a duty to condemn the world. Christians do not have a duty to sort people out as saints or sinners—that’s what God does. Christians have a duty to live as Christ has commanded—love God, love neighbor, care for the poor, visit the captive, lift up the downhearted, and heal the sick. The institution of the Church, organized religion, offers to everyone this day an opportunity to experience the grace of God in communion with Christ Jesus. Organized religion, the institution, comes to the world in all humility to do the one thing no one expects—wash feet. 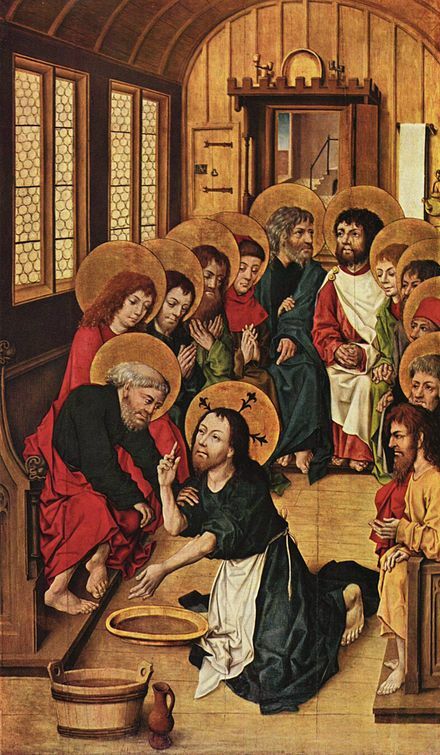 Christ Washing the Feet of the Apostles ~ Meister des Hausbuches, 1475 (Gemäldegalerie, Berlin). Maundy Thursday then is a day for the faithful to renew their faith, to come forward in humility exercising Christ’s mandate to do as he has done—wash feet. Further, on this day we are in sad communion with Jesus as he prepares to go to the cross. We grieve for him and our lives go momentarily dark as the reality of death meets us in the days ahead. This is both a glorious and sad day. Maundy Thursday is a day that gives a good name to organized religion. Therefore, the message of Thursday in Holy Week is that the followers of Christ Jesus are to be available, to be open to, and to listen to the command of Jesus in the upper room at the Last Supper, “do as I have done to you.” When what he has commanded his followers to do, the world is better for it—that is the role of organized religion.